The Storm beat the Sky, 80-76. Chicago can’t get a break right now. Epiphanny Prince came back, and scored 18 points with six assists. But Elena Delle Donne sat, suffering from a Lyme Disease flare up. Yikes. 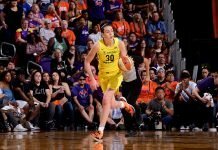 The Mercury defeated the Mystics, 81-66, behind Brittney Griner’s 20 points. All-Star forward Tamika Catching says “basketball is a universal language” in discussing the team’s diversity night tomorrow.